It’s been a busy summer for us here at 10xU, starting with our official launch in June at eMerge Americas. Since then, we have been working tirelessly to connect and mentor the entrepreneurial community, developing a series of events, tools, and conducting one-on-one mentoring sessions to prepare entrepreneurs to succeed. Many founders were coming through our doors with great ideas and even great businesses but no clear roadmap to success. So, we hosted several workshops, from “Becoming a Better Founder” to our “Fundraising Bootcamp,” a two-part fundraising intensive to help entrepreneurs hone their pitching skills. We partnered with organizations to host events, including “Decoding the Fundraising Process” organized in conjunction with Starthub Miami. We developed the pitch deck roadmap, a tool to help entrepreneurs see the strengths and opportunities for improvement in their pitches, as well as provide a framework to steer conversations with investors. Many of them went through our Cobuild Course where they learned the fundamentals of exponential startup growth and worked with our experienced mentors one-on-one to hone their business model and pitch. The end goal was to give entrepreneurs the skills they need to step in front of a room full of investors ready to pitch, and deal with the onslaught of questions investors were sure to have. And then, we put entrepreneurs face-to-face with real world investors during the first-ever 10xU Pitch Day, hosted in partnership with Rokk3r Labs, Rokk3r Fuel, and Eight Dragons. The 10xU Pitch Day was developed with one objective in mind: to allow entrepreneurs to meet with different types of investors that could ask them the tough questions, while also connecting investors with aspiring entrepreneurs earlier in their journey, offering them the opportunity to build relationships with startups poised to succeed and scale. Marcus Dukes, the consulting advisor to the CEO of publicly traded venture firm Eight Dragons, a shareholder of Rokk3r Labs. Eight Dragon’s goal is to bring great ideas to exit, by identifying entrepreneurs with the right ideas and help them go to market using Rokk3r Labs and other companies in the Eight Dragons ecosystem. Jeff Ransdell, a General Partner and the Managing Director of Rokk3r Fuel. Rokk3r Fuel is a global VC firm committed to identifying early and later-stage companies, leveraging exponential technologies that can bring disruption to stagnated industries or verticals. Christopher Staley, formerly a Rokk3r Labs founding team member, is a Principal at Rokk3r Fuel and is currently responsible for leading all due diligence on new companies joining the Rokk3r Fuel portfolio. Juan Montoya, cofounder, and COO of Rokk3r Labs, who is deeply involved with the cobuild process, turning ideas into companies, while mitigating risk using the exponential company framework. David Rivera, a private angel investor and consultant, who brings more than 25 years of experience in the technology industry working with multinational companies such as IBM, Accenture, and AOL. Five different companies stood in front of these seasoned judges, and each other, in a crowded room to present their pitches in 7 minutes. After each of their presentations, they received feedback from the judges, who asked probing questions about their strategy and business model. Anything from their plans for the funds, their competitors, and estimated growth projections was fair game. dalENT, a medical device company changing the way sinus infections are treated today. All of these companies are part of the 10xU community, working with 10xU mentors, attending our workshops, and have been actively applying the 10xU methodology. Most of this being done in the context of our Cobuild course. We decided it would be great to get crowdsourced feedback and have everyone in the room vote on which company delivered the best pitch, and ultimately, the crowd decided on a tie, awarding both dalENT and Rawshorts. Both companies that won will receive a year’s subscription to the upcoming 10xU member’s only community, where they will be privy to relevant content, exclusive events, and additional workshops, and will soon be featured individually on our blog. So, stay tuned for more news on the winners! We are proud and humbled to share the first-ever 10xU Pitch Day was a success beyond our expectations. As a company focused on educating and helping entrepreneurs build a roadmap to grow and scale their company, we couldn’t feel more accomplished. This event serves as validation that we are on the right path, fueling our determination to continue building bridges and paving the way for aspiring entrepreneurs seeking to break out of the linear business mold. 10xU acts as the primary access point to the Rokk3r Labs ecosystem, and by putting those founders we coach in front of potential investors, we are actively contributing to the growth of the entrepreneurial ecosystem. This is the first of many 10xU Pitch Days to come. Ultimately, we want to drive disruptive innovation, and this is only possible if we give aspiring entrepreneurs the right skills and support to succeed, while connecting them with those who can help facilitate that success, whether it be mentors, investors, or just a vibrant like-minded community. We hope you can join us next time! Our goal at 10xU is to help entrepreneurs launch and scale their companies rapidly. This often requires raising money to accelerate growth. But the fundraising process can be confusing, and it’s hard to get a straight answer—or even an actual “no”—from investors. There are lots of templates online, but nothing that tells you how to improve your specific slides. What founders need is a pitch deck roadmap. So we’ve created one. You can grab it here for free. Highlight your startup’s best attributes in your pitch. Fill in any missing info that you already have. Identify opportunities to improve your business over the next few months. Professional investors may look at 1,000 startups per year—and invest in three. How do you make sure you stand out? The secret is to show investors that you’ll make them rich. This means reducing the amount of risk—by increasing the amount of validation that your plan will work. You can expect to have several conversations with anyone who eventually puts money into your company. People invest in patterns, and your first meeting is simply one dot. Your next few meetings create your pattern—so your job is to actively manage this process. Always show up talking about new things you’ve accomplished without the investor’s money. This creates FOMO while also highlighting your hustle. We recommend always running the “No money plan” while you’re out raising money. We’ve seen successful entrepreneurs sit down ahead of time and create a calendar of good news that they’ll talk about during the raise. The short story is that great companies are able to raise money—so how do you create a great company? 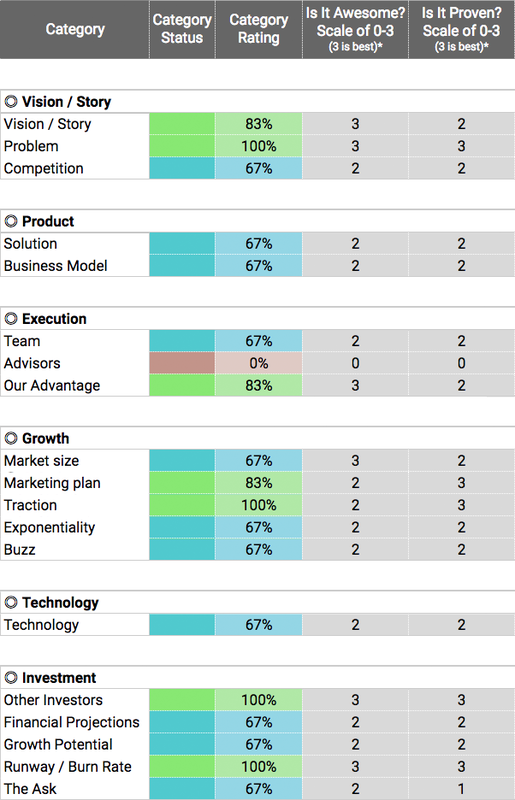 First, we took data from CB Insights on why startups fail and mapped it to six main areas of focus to help startups not only succeed—but grow exponentially. These form the foundation of our 10xU roadmap. We believe in these six pillars so much that we built our entire Cobuild Course around them! These six pillars are the roadmap, and they also complement the approach of our colleagues at the $150M Rokk3r Fuel fund. We want to be able to share information back and forth with them about the startups we’re both working with. So now that we know where we’re going, how do we get there? Those are actually examples of investors saying no, but it doesn’t feel that way. That’s because investors don’t want to shut a door on something that may eventually turn out to be awesome. So from the investor perspective it’s better to defer. This makes it hard for entrepreneurs to get detailed feedback about their pitches from investors. We created the 10xU Pitch Deck Roadmap to help. It highlights areas where a company is strong, uncovers things that founders may have accidentally forgotten to include, and lets entrepreneurs know where they need to focus on making changes to the actual business. So now that we know what investors look for—along with what makes startups successful—we can use the 10xU Pitch Deck Roadmap to see both strengths and areas for improvement. Once we know our strengths, we can re-organize our pitch decks to focus on them while minimizing the opportunities for improvement. The goal is to give the entrepreneur a map of what their pitch deck is telling investors, not to be confused with the actual strengths and weaknesses of the company. In fact, our summary often reminds entrepreneurs that they simply forgot to include great information that they already have. It’s exactly the feedback that founders want when they pitch investors, but often don’t receive. Story — Does this company have a compelling massive transformative purpose that will attract the best talent, customers, and investors? Problem — Is this company tackling a proven problem, meaning competitors exist with real revenue already exist and/or the founders have done extensive customer validation interviews? Counterintuitively, companies that tackle proven problems tend to be the most successful. Competition — Does the investor get a clear understanding of this company’s position vs. its competitors? The answer is often no, which is a red flag. The most promising startups have competitors and can clearly articulate how they differ. Solution — Is this solution 10x better than existing solutions? Ben Horowitz famously states that your solution has to be so much better that people are willing to go through the pain of changing their behavior. It’s tough to win with only a marginal improvement unless you’re already an established player. The point of an MVP is to deliver one thing that customers value so much that they’re willing to put up with a crappy experience, which you can improve over time. Business Model — Does this company have a proven method to make money at scale? We see a lot of pitch decks where the idea is to build a big audience and figure the revenue out later, but this usually doesn’t work. Even Facebook knew how they were going to make money, and it’s still incredibly expensive to build a free audience large enough to generate meaningful advertising revenue. Advisors — Does this company have world-class advisors with relevant experience? Reach out to leaders in your field until you find some who will help you. This has the benefit of forcing you to keep improving your value proposition along the way. Market — Is the potential market large and growing? Is it clear who the early adopters will be? Think about Uber going after the entire taxi / black car market, and first targeting young techies in San Francisco and New York City. Smart investors look for rising tides that will lift all boats—which reduces the risk that this particular company won’t be well-run. Marketing plan — Does this company know how to acquire customers at scale? Smart entrepreneurs have already done marketing tests and figured out channels that do and don’t work, along with CAC (cost to acquire each customer), churn (what percentage of customers leave each month), and LTV (average lifetime value of each customer). Traction —Has this company found product / market fit, with evidence in the form of strong KPI growth (engagement, revenue, etc.)? Marc Andreessen famously states that a startup’s only job is to find product / market fit, and that you’ll know it once it happens because it feels completely different. Your goal as a startup is actually to create a working business model—not simply a great product—and traction is the proof that you’re succeeding. Exponentiality — Does this company have a solid MTP, the potential for engaged community, access to shared resources, and/or is it creating and utilizing big data? We’re particularly obsessed with exponentiality at 10xU because it allows smaller teams to have an out-sized effect on the world. Buzz —Are there lots of happy customers and/or articles in the press? The most effective form of marketing is word-of-mouth, and investors often want to talk to actual customers as part of the due diligence process. Technology — Has the company created awesome technology (if applicable)? Is there a strong development team, preferably in-house? A startup’s access to great product managers and developers, along with its process for running sprints, determines its success over time. Assessing this area usually requires due diligence rather than simply looking at a slide in a pitch deck. Current Investors — Are world-class investors with relevant experience already involved? In their pitch deck, Front lists Stewart Butterfield, the CEO of Slack, as an investor in the current round. Think of how getting into Y Combinator or Techstars can set a startup up for future success. Financial Projections — is there a clear, achievable path for the planned use of funds to generate at least 3x the valuation for the next round? It’s harder to find investors when you’re saying, “Give us the money and we’ll figure it out.” It’s easier to raise money when you’ve already built the rocket ship and you’re just asking for fuel. Growth Potential — Does this company have the potential for an IPO or other large exit by being acquired? Professional investors are looking for big wins, because they know that most of their portfolio will turn out to be losers. Friends and family, on the other hand, may be more willing to invest in you personally regardless of how big the opportunity is. Burn Rate & Runway — How much money does the company burn through each month (total revenue minus total expenses), and how many months before they run out of cash? Investors want to know that their money is being spent wisely on things that will maximize success. The Ask — Is the company making an appealing offer, with attractive terms and valuation? Startup investing is a market like any other, which means investors are usually looking for reasonably-priced deals. In the same way that you can’t make up a price when selling your home, you’ll want to be in the same neighborhood as other comparable startups in your area. Ask your lawyer to provide some insight, since she sees deals all the time. Is It Awesome? And Is It Proven? Is it awesome? How amazing is what this company is doing, especially compared to the 999 other pitch decks we’ll look at this year? Is it proven? Does this company have data proving their claims are real? Your business plan is actually a set of hypotheses and your job is to validate them or pivot when needed. Again, the goal isn’t to get 100% in each category. In fact, Front used this pitch deck to successfully raise their $10 million Series A round without mentioning a single world-class advisor. But they were strong in most of the categories, and had data to back up their claims. Our pitch deck roadmap gives you a quick snapshot of areas where you’re strong, as well as areas that could use improvement. Sometimes “improving a pitch deck” means re-working a slide or two. You simply forgot to tell part of your story, or to mention some data you already have. That’s easily fixed in a few minutes. People connect with stories, so you definitely want to spend some time giving your pitch a story arc that gets your audience excited about what you’re doing. You win when you make them feel emotions, especially passion. Other times “improving a pitch deck” means actually working on parts of the business. It may take weeks or months to design effective experiments and collect the data you need. You may need to find and work out an equity deal with a co-founder. You may need to acquire your first paying customer and build a pipeline of ten more qualified leads. You may need to run several two-week marketing sprints to figure out which are your most effective customer acquisition channels along with CAC (cost to acquire each customer). The main thing is “show don’t tell” wherever possible. Lots of entrepreneurs say they’re going to change the world (just as soon as they get the money). Very few entrepreneurs show they’re already successfully changing the world. Investors love this second group precisely because they’re so rare. Remember that angels and VCs may look at a thousand pitches each year and invest in three. One thing we didn’t include in this model is weighting the different categories according to their importance. For example, most investors consider the team to be more important than the solution and the business model. A good team can pivot and still succeed. Vinod Khosla says that he will almost certainly invest in a startup if he’s impressed enough by two of the founders that he can picture himself investing in their next companies, regardless of what the current business is. If you think of it from the investor’s perspective: they want to bet on people who are likely to win even if the business model changes, they want proof that this plan is going to work (vs. the 999 other pitch deck’s they’ll look at this year), and they want to see that other investors have already done the due diligence and put money in. That being said, you still have to get the business model right in order to generate traction, retain a rock star team, and attract the right investors. Social Proof—Your rock star team, your world-class advisors, and the investors already on board combine to make people feel comfortable giving you money. Front’s Series A pitch deck lists Stewart Butterfield from Slack in their current round. Doesn’t that make you want to invest? Momentum—What are you accomplishing right now, without raising the money? You’ll have multiple conversations with investors before they put money in, so make sure that you always have something new to report. At 10xU, we call this “Running the no money plan,” meaning that you keep hustling no matter what. It’s much easier to raise money when you don’t actually need it. And all of that momentum creates FOMO and helps you land investors. The 10xU Pitch Deck Roadmap tool is designed to be easy for you use BUT it’s hard to be objective. For best results, you may want to have a trusted advisor fill it out for you. Or you can reach out to us and we’ll take a look. We’re just starting to use the Pitch Deck Roadmap, so please let us know how it goes. We want to hear your feedback so that we can make it even better. Written by Mike Lingle — Find more practical suggestions for entrepreneurs at 10xU.com or connect with me on LinkedIn. We’ve been answering a ton of questions about startup fundraising recently, so we thought we’d share some answers. Q: Are there any pitfalls of getting money from people you know, like friends and family? It’s sometimes easier to convince people you know to invest, especially at the beginning when you still don’t have a real company. For friends and family, it’s more about you, your idea, and your potential to execute. On the flip side, there are people who prefer to keep business and friendship separate. Be sure to consider what happens if you don’t succeed before you take friends and family money. It’s a totally personal decision (if you’re lucky enough to have the option). Q: If I can self-fund is that better than getting investors involved at all? You can get started right away, and you don’t waste time and money looking for investors, pitching, dealing with lawyers, etc. It’s 100% your risk, so you don’t add the pressure of other people’s agendas. You reduce your financial risk (it’s not smart to invest 100% of what you have in a single thing: a company, a single stock, etc.). Great investors can help you with more than just money: introductions, guidance, etc. Accountability to other people can help you achieve your goals. Q: Do investors like to stay in industries they know, or are they looking to diversify their portfolio? It totally depends on the individual. Many investors like to stick with industries they know as a way to reduce risk, because they can better evaluate ideas and proactively help with suggestions and introductions. There are other investors who focus on specific technologies, not industries. For example, blockchain can be applied to finances, notary, cybersecurity, etc. Artificial intelligence also crosses many different industries. Other investors—like our own Rokk3r Fuel fund—aren’t focused on a specific region, industry, or technology. Another way to classify investors is by which stage of startup they invest in. Angel investors tend to invest earlier because they deploy less cash. Institutional investors—VCs and family offices—usually get involved at Series A or later, and tend not to invest in early stage companies. Q: is it better to have multiple investors? Many times you need multiple investors because investors feel most comfortable participating in groups. A fund who invests in one round may require you to find a different lead investor for your next round, for example. This helps them sanity-check that the investment is attractive to other professionals. Or you may be asking for more money than any single investor has available, so you’ll need to assemble a group. Focus on finding a lead investor first, and then everyone else will feel more comfortable putting money in. Social proof and scarcity help you raise money—think about how you can politely add some FOMO to the equation. Having only a few investors makes everything easier (paperwork, reporting, etc.) so we recommend it at the early stages. FYI – Big investment funds have minimum thresholds for new investors ($250k minimums, for example) because they don’t want to deal with a bunch of paperwork and management for lots of tiny investors. Q: How many rounds of fundraising do most companies typically go through? It depends. 99% of investors invest because they are looking to get at least 10 times their money back in 5-7 years. This means that they are expecting you to either sell your company or IPO so they can get their money out. Of course that’s just a reference, it might take longer or less than 5 years. This article lays out the how many rounds of fundraising startups usually go through. Most startups do a few rounds of funding in that time. Unicorns do more rounds. WeWork just raised a Series G, for example. Founders and some investors are typically taking some money off the table in these big rounds at successful companies. Q. What else can you tell me? Crunchbase is a great source of information for this type of stuff. You can also browse companies and see how much money they’ve raised, from whom, how many rounds they’ve done, etc. It’s not 100% complete, but it gives you a good idea of what’s going on out there. Exponential startups can beat big traditional companies — and they do it with fewer employees. We’ve built over 40 companies in the past five years, and in that time we’ve become big fans of Salim Ismael’s Exponential Organizations, which describes how to create lean companies that have an outsized impact on the world. Exponential organizations stay small and scale at least 10x faster than traditional businesses. Smart companies can drop the cost of both supply and demand to almost zero by using the latest digital technologies, leveraging shared assets, and tapping into the power of the crowd. When WhatsApp was acquired by Facebook for $19 billion they only had 55 employees! A year after the acquisition they had 900 million users — still being supported by a small team of only 50 engineers. What about Hyatt, which was the leader in hospitality? Over more than 60 years they’ve built up a giant portfolio of 600 locations in 57 countries and 550 cities across the globe. It’s a massive infrastructure based on real assets. Then Airbnb introduced a disruptive business model based on the fact that they could use bedrooms similar to the ones Hyatt was building—but without owning them. They could tap into the power of the crowd to leverage abundance. 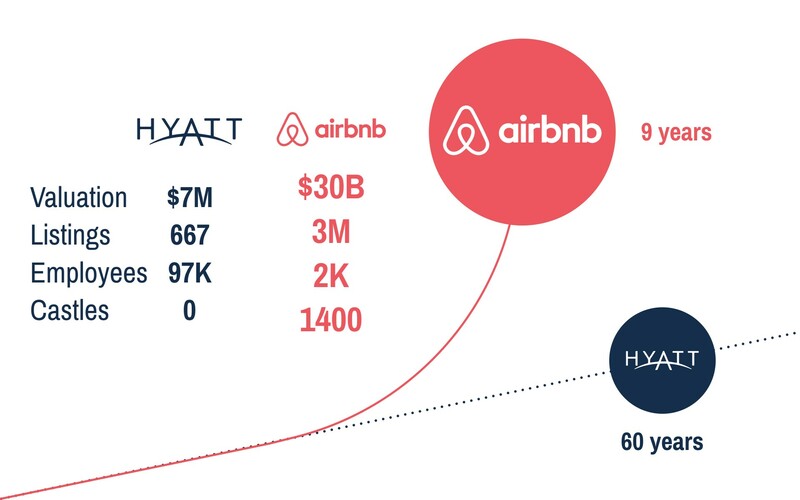 Here’s a video walkthrough of Hyatt vs. Airbnb (linear vs. exponential company). The genius of Airbnb was to create a platform — not to create more assets, but to connect existing assets and make them accessible to everyone. Airbnb can add new rooms almost for free, whereas Hyatt has to build or buy them. Airbnb is completely focused on creating value for their customer, not on building hotels. Not on expanding in countries and cities. Just on building a solid platform with a global reach. The result is that Airbnb is now in more countries and cities than Hyatt, and they have over 3 million listings. They even have 1,400 castles. But the biggest thing isn’t the massive outcome — it’s that Airbnb achieved all of this with a tiny fraction of the number of employees. Only 2,000 people are creating a company that’s worth more than 30 billion dollars. Compare that to Hyatt’s 100,000 employees and $7B market cap. That’s truly exponential! And it’s how we think at 10xU. In our last article we set the stage for successfully raising money for your startup (you can find fundraising tips #1 through #3 here). Today we’ll keep walking through great suggestions from Sari Azout, one of our entrepreneurs-in-residence at 10xU. The goal is help you attract the right investors. If you have a social media platform then you may want to get to 100 thousand users. If you have a SaaS business you might want to get to 10 paying customers. If you have a subscription business you might want to get to 1000 subscribers. Ffigure out what those core KPIs are, and what that important milestone is that you need to get to in order to raise the subsequent round of funding. Now you can figure out how much money you need to raise to get there. Be prepared to outline how the numbers will work and how the costs and the metrics will line up. Tip number 5 is that fundraising is a numbers game. You can’t expect to just meet with a few investors and raise money. You actually have to hear “no” until you hear “yes.” A lot of people have a sort of irrational optimism when it comes to fundraising, partly because investors rarely just say no. Instead they’ll just keep you lingering—in case you start doing well. But this is a numbers game. You need to have a strong pipeline. I usually recommend reaching out to 50 people that invest in your specific type and stage of company. Maybe 25 percent will give you a first meeting, and maybe half of those will give you a second meeting. And so from those 50 you can potentially land one or two lead investors. Fundraising is a full-time job and you want to get back to building your business as quick as possible. Part of this is managing the psychology of investors and figuring out how to generate FOMO without lying. The truth is that investors are largely driven by a herd mentality, which means the first check is the hardest to land. Once you do get that first investor on board the rest of your round usually gets easier to fill. Hopefully these six tips have given you a framework you can use to raise money for your startup. Please leave a comment with any questions. Written by Mike Lingle — Find more practical strategies for startup growth at10xU or connect with me on LinkedIn. I’ll take you through her first five tips to help you raise your next round. She points out that fundraising is a lot harder than most founders expect it to be, and will take up a lot more time than you would like. In addition, funding is distracting so you need to be prepared and disciplined in order to maximize your chances of success. Having conviction about the team beyond quantifiable growth or user metrics is really the major driver for how VCs decide to invest in companies. The second tip is that you should always be meeting with investors. VCs invest in people—and the reality is that you get to know people over time, not just in a single meeting. It’s smart to start meeting with potential investors before you actually need the money. People invest in patterns, not just one meeting. The best way to get to know them is to ask them for advice. Walk them through what you’re doing and ask what they would focus on. You can also ask them what they’d need to see in order to invest. Then keep them in the loop with regular updates. This makes it easier to ask them for a check later on when you’ve reached enough traction because they’ve been participating in your journey and they’ve already seen you execute. The third tip is to avoid launching a funding round with just an idea. The reality is that investors get pitched hundreds — if not thousands — of ideas every year. Most of them don’t get excited by ideas anymore. Startup funding is hard enough as it is, and if you only have an idea then it’ll be even harder. Investors want to see roadmaps. They want to see how you hire. They want to see what kind of talent you can retain. They want to see customers. They want to see evidence that you can actually execute on your idea, not just talk about it. It may be possible for you to raise money from friends and family on just an idea—but even then you want to have some evidence that you’ll be able to build a successful business. We’ll cover more of Sari’s fundraising tips in a future article. Do yourself a favor and watch the entire thing. It’s pure entrepreneur gold! Let’s unpack these and see how to apply them to our own startups. This means that every founder’s #1 goal is to attract and retain great talent. Great people are attracted to great people. Khosla says he still spends a big chunk of his time on hiring, so he’s always looking for ways to increase the flow of inbound applications—and he’s always trying to keep the talented people he finds. So if you build a community of rockstars that everyone can learn from, it helps you attract more rockstars. The résumés come pouring in. Awesome people are also an effective fundraising tool. Khosla loves to invest in great teams. If he’s talking to a startup he’ll ask himself if he’s impressed enough with at least two of the founders that he would invest in their next companies. If the answer’s yes then he’ll pretty much always put money into their current company, even if he doesn’t love the business plan. He’ll always pick people over plan. He’s playing the long game, and sacrificing equity in order to get the magnets to stick around. You’ll still want to use a vesting schedule—or Mike Moyer’s Slicing Pie formula—to ensure that team members are actually contributing. Most entrepreneurs focus on maximizing their ownership percentage—which is the opposite of what Khosla recommends. His point is that by hiring awesome people you’re more likely to generate enough value that it doesn’t matter if you own less of the company. Khosla wraps up by pointing out that you also need a big vision to attract superstars. It’s called a massive transformative purpose (MTP) and it’s the key to achieving exponential growth. It’s the combination of MTP and generous equity that allows you to attract and retain the rockstars—who in turn help you attract more great team members. Written by Mike Lingle — Find more practical suggestions and free webinars for entrepreneurs at 10xU or connect with me on LinkedIn. You can grab our milestones slide template for free. Simply make a copy from the Google Docs File menu and assign a new theme or use View>Master to customize the one we’ve provided. The problem here is that it takes a minute to figure out that some of these Buffer items have already been accomplished—whereas others are slated for future milestones. Can you tell which is which? The giveaway is the green text. It’s easier to understand if you split the past vs. future into separate columns and then use checkmarks to indicate completed items. Investors love entrepreneurs who are always hustling. You instill confidence that you’re the right team to reach the next set of milestones by showing how far you’ve already come. Your ability to get things done is what separates you from the hundreds of other opportunities your investors are looking at—and it’s what convinces them that your startup is the right place to put their money and time. List the few main items that you’ve already achieved in the first column. These typically include traction, product, and fundraising. You want to show investors that you’re a natural born hustler and that you’re already making the magic happen. Now they feel more comfortable giving you their money. You should include everything that shows how awesome you are, but keep the list to five items or less so that people can read it quickly. Now that you’ve instilled confidence in your audience, you want to lay out your next steps. Start by time-boxing the list with something like, “Next Six Months.” You want to be aggressive, but keep it realistic because you’re making a promise to your investors. One of the most common mistakes we see in pitch decks is forgetting to include the “ask.” We get to the last slide and we still don’t know what you want. Always put what you’re asking for in writing on the last slide. Your audience will thank you. Remember that your ask can change depending on who you’re presenting to, like a strategic partnership, etc. You don’t need to provide too much detail on actual deal terms here, because if people are interested you’ll be able to talk them through the specifics. Finally, list the milestones you’ll accomplish with the money. It’s best to focus on what you’ll accomplish (“$10k monthly recurring revenue”) vs. how you’ll accomplish it (“Hire 3 developers and a project manager, release version 2 of the product, ramp our spend on Facebook and Twitter ads”). If you do want to get that specific then you can do a separate “Uses of Funds” slide with a more detailed list. This is your promise to investors: “If you give us this money then we will hit these milestones.” So make sure you can do it. The goal is to stand out from every other deal these investors are looking at. You do this by spelling out how much you’ve already achieved, what you’re asking for, and what you’ll accomplish in the next phase along with how long you expect that to take. Putting this all on one slide sums it up for your audience shapes the conversation you’re about to have with them. You can also work backward from what people would need to see on this slide in order to invest. Then go out and do those things before you start raising your next round. Expect to have multiple conversations with people before they put any money in. For best results, report new progress every time. Investors want to see momentum in order to feel comfortable putting money into your company. So make sure you’re always moving the ball down the field. Here a are a few examples of what works and what could be improved (although it’s true that all of these companies successfully raised money). > This final slide from Mixpanel provides incredible social proof. If all of these amazing people have invested, then why shouldn’t you? In fact, you’re probably missing out if you don’t invest! They did miss a chance to state what they’re asking for and what they’ll do with the money. We also recommend including a logo on all of your slides. > This milestones slide from Intercom does a great job of laying out the ask and what they plan to do with the money. The only thing we would add is a short list of accomplishments. You’ve just delivered the best pitch of your life. You get to this last slide, the investor looks at both columns and quickly understands where you’re coming from, where you’re going, and what you need to get there. She immediately starts asking questions. This is exactly what you want! Putting this milestones slide last in your pitch deck usually starts a conversation focused on whatever’s most important to you. You can grab our milestones slide template here. Good luck, and let us know how it goes! SlideRocket was presentations in the cloud, originally targeted at business users. I started the company with two other people and all three of us had income from other businesses. We were building the next generation of my presentation company, so I had customers we were planning to bring over to the new system when it was ready. My partners had months of severance from their last startup. So we were able to self-finance the idea and prototype stages. We talked about raising money via a convertible note, but decided to wait until we had more traction in order to do a larger round and get better terms. We had the advantage of starting with product market fit because I already had paying customers, so we focused on building what they wanted. We did a pre-announcement on TechCrunch in March 2008 and started getting signups to our waitlist. We launched six months later in October, and we raised money in December. So our investors could clearly see how quickly users were adopting our service, and we took much of the guesswork — and risk — out of the equation. If you’re in the idea stage then shoot for $25k to $50k from friends and family. Or convince your first big customer to pre-pay. Or save up enough money that you can fund it yourself like we did. At SlideRocket we had a waitlist of thousands of people, both free and paying users (although no real revenue yet), and customers from my previous company ready to migrate. We built out five years of financial projections and decided to raise $2 million based on projected revenue and headcount. For companies in our position, Sari Azout — partner at Level Ventures and Entrepreneur-in-residence at Rokk3r Labs — recommends budgeting $15k per person per month for 18 months to cover salary, office space, equipment, general costs like servers, and a margin of error. So at that rate our $2 million would give us 7.5 people for 18 months, which is more or less what we did with the money. We had two founders at that point and we hired a VP of marketing, a lead developer, a head of QA, an inside sales rep, and a head of business development. We did, in fact, go through the money in about 18 months. Fundraising is a lot like dating, and we had to kiss a lot of frogs (no offense to anyone we met with). The people we talked to fell into two categories: venture capital firms (VCs) and strategic investors. Strategic investors are larger companies that invest in startups, and we had one big-time Web services firm who found us via our TechCrunch article. That led to a bunch of productive conversations and they ultimately offered to invest. We were meeting with VCs and other potential strategic investors at the same time. Most of these meetings didn’t go anywhere, and sometimes people were interested but we could tell they weren’t the right fit. One VC wanted us to change both our business model and our behavior — which is a lot to ask of a startup! We got many of our investor introductions through friends and colleagues. We also hired DLA Piper, a law firm with a big Silicon Valley presence, who helped us with our pitch deck and made a few intros through their startup pipeline program. They cut us a deal where they didn’t charge us until we raised money, at which point we cut them a (big) check plus some warrants that they made money on when we were acquired a few years later. Sometimes the VCs would introduce us to other potential investors, either because they weren’t interested or because they didn’t want to lead the round. We met amazing people like Tim Draper and Fred Wilson, and we spent a bunch of time on Sand Hill Road. When people talk about “valuation” they usually mean pre-money valuation — so how do you know what that is? If you were an established company you could use discounted cash flow — but that’s hard with pre-revenue startups. So $2 million of cash invested into a company with a pre-money valuation of $4 million = $6 million post-money valuation. The shortcut we used was that our VCs wanted to own about 1/3 of our company after the transaction. So that allowed them to solve for the pre-money valuation by dividing cash invested by ownership %. So $2M Cash Invested ÷ 1/3 Ownership = $6M Post-Money Valuation. Now simply subtract the $2M Cash Invested from the $6M Post-Money Valuation to arrive at a $4M Pre-Money Valuation. The offer the VCs made us was “2 on 4” — meaning a $2 million cash investment on a $4 million pre-money valuation. We negotiated “2 on 5” — meaning a $2 million cash investment on a $5 million pre-money valuation, which gave our VC 28.57% ownership (their $2 million cash investment divided by the $7 million post-money valuation). So we saved almost 5% of equity. We were okay with the VCs taking about 1/3 of the company because it gave us cash in the bank plus the social proof of taking money from a firm everyone recognized. One of their partners with operating experience joined our board of directors and was hugely valuable as we grew. You’ll get the best deal when you have multiple offers on the table at the same time. We had two VC term sheets in hand plus a $1 million offer from the strategic investor. Everyone wanted a board seat, so we had to decide between a three-person board (one of us, one investor, and one independent) vs. a five-person board (two of us, two investors, and one independent). Having three options put us in a great position to negotiate. After some back and forth we ultimately decided to go with a single VC because we were concerned that the strategic investors might restrict our freedom by steering us away from working with their competitors. Also remember to keep an eye on your potential exit price. Your series A investors are looking to get at least 10x their money within 5 to 7 years. That means they’ll want you to sell your company that’s currently worth $7 million post-money for $70 million. And if your company has a $20 million post-money valuation then you’ll need to sell it for closer to $200 million. Crunchbase reports that the average acquisition price for startups since 2007 is $155.5 million, so it gets harder to find buyers the further you go beyond that. There are many more companies who can acquire you for $50 million vs. $500 million, so it doesn’t necessarily help you to raise more money. Keep in mind that Michael Arrington reportedly made more money selling TechCrunch for $30 million than Arianna Huffington did selling Huffington Post for $315 million — because he had raised less money so he still owned 80% of his company. There’s a lot more to discuss on startup valuations, so I’m hosting a free workshop on valuing your startup this Thursday, 6/22 at 6p ET. You can attend either online OR in our awesome new 10xU learning center in Wynwood, Miami. Free RSVP is here: bit.ly/Valuation10xU. Bring your questions! Written by Mike Lingle — Find more practical suggestions for entrepreneurs at 10xU.com or connect with me on LinkedIn. Why Didn’t You Buy from Us? The key to a successful startup is understanding your customer. This sounds obvious, but for some reason it’s not. Yesterday we talked to an entrepreneur who’s poured $90k into his beautifully-designed product — and he’s only just now starting to think about revenue. So he’s asking investors for money to figure it out. But that’s not how it works. Smart investors want you to already know how you’re going to make money AND they want you to already have some proof that your plan is going to work. Otherwise you’re just taking a giant gamble with their investment that probably won’t pay off. You might not be able to see this, but they definitely can. We recommend spending as much time validating your sales and marketing as you do developing your product. The toughest thing to understand is why people DON’T buy from you. They check out your website. They read the emails you send them. They scan your articles. They watch your videos. And then they don’t buy. Here at 10xU we recently ran a marketing campaign aimed at entrepreneurs who want to learn to build successful startups that scale. Some people bought a six week course — but many more didn’t buy. This is called negotiating against yourself. Don’t do it. There’s no evidence that price is the issue. The thing is that people who don’t buy from you usually don’t tell you why. So we decided to try to find out. Hi- Startups are hard! We’re always telling entrepreneurs to talk to customers, so now we’re practicing what we preach and I’d like your advice. It looks like you’re interested in our Cobuild Course — but you didn’t pull the trigger. I’d like to offer you one of our awesome two-hour classes for free in order to learn why. 1. Fill out this short survey. 2. Attend the first class of our next cohort for free (I’ll email you the info). You’ll be doing me a huge favor! And I promise you’ll get a lot of great info from the class to help you with your startup. We sent the email in two waves. For the 25 hottest prospects we used one of our actual email accounts so that it was more personal. We waited a day, and then for the rest we did an email blast but also made sure it came from a personal email address. We decided that giving away a spot in one of our two-hour classes was our best offer because it’s only interesting to our target customer AND it lets people experience our product — which is the main thing we’re trying to accomplish right now. These are very different than pricing, right? Now we know that we need to do more nurturing and free content (which means you’ll be seeing lots more free stuff from us). We agree that the in-person mentoring is where the magic happens. The classes give entrepreneurs the roadmap to building a successful business — and the mentoring sessions allow us to deep dive to provide specific help for their individual situations. Price did come up a few times, but it’s not the biggest factor. We even hopped on a video chat with one of the people who showed up for the class to do a deeper dive on his experience with our brand. Yep, that’s right, we got to talk to a stranger we found on the Internet about his impressions of 10xU and what he likes and doesn’t like about our offering. It’s pure marketing gold! Written by Mike Lingle — Find more practical suggestions for entrepreneurs at 10xU.com.